Friday November 11th 1892 I was busy with the house work the most of the day. I did a little mending in the afternoon. Fanny was over in the morning and said Ott went to Nichol Station on the early train. They sent word at five oclock he was back so Will hitcherd to the surry after supper and we all went to Aunt Ems to attend Elmers wedding reception. Had a very pleasant tie, got home byone oclock. 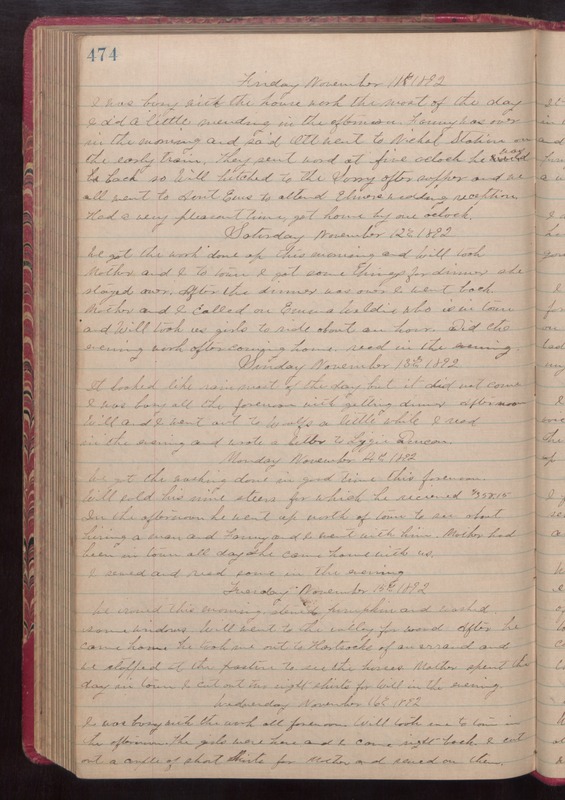 Saturday November 12th 1892 We got the work done up this morning and Will took Mother and I to town. I got some things for dinner. She stayed over. After the dinner was over I went back. Mother and I called on Emma Weldie who is in town and Will took us girls to ride about an hour. Did the evening work after coming home. Read in the evening. Sunday November 13th 1892 It looked like rain most of the day but it did not come. I was busy all the forenoon with getting dinner. After noon Will and I went out to Woolfs a little while. I read in the evening and wrote a letter to Lizzie Duncan. Monday November 14th 1892 We got the washing done in good time this forenoon. Will sold his nine steers for which he received $358.15. In the afternoon he went up north of town to see about hiring a man and Fanny and I went with him. Mohter had been in town all day. She came home with us. I sewed and read some in the evening. Tuesday November 15th 1892 We ironed this morning, stewed pumpkins and washed some windows. Will went to the valley for wood. After he came home he took me out to Hartsocks of an errand and we stopped at the pasture to see the horser. Mother spend the day in town. I cut out two night shirts for Will in the evening. Wednesday November 16th 1892 I was busy with the work all forenoon. Will took me to town in the afternoon. The girls were here and I came right back. I cut out a couple of short shirts for Mother and sewed on them.